The typical adult in Beverly Hills gains one to two pounds each year. While this may not seem like much, if left unchecked, that’s an extra ten pounds every five years. 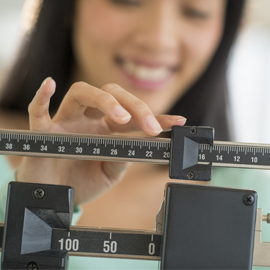 The good news is that small changes can help prevent this gradual weight gain and even help you lose weight. Eat breakfast. Research shows that those eating breakfast cut their chances of developing diabetes and obesity by 35-50% compared to irregular breakfast eaters. Walk when talking on your phone. Ten minutes a day can provide a 1,000 a month calorie burn. Add sleep. A lack of sleep increases cortisol, a stress hormone. Too little sleep also keeps your body from burning carbohydrates, leading to more stored body fat. Be cautious of coffee drinks. Calories build up quickly in gourmet coffee concoctions. Avoid white foods. Most high-calorie carbohydrate foods are white, such as potatoes, bagels, rice and breads. Choose bread with whole grains and at least two grams of fiber per slice. Drink plenty of water. Staying hydrated keeps you satiated, since your body will often mistake thirst for hunger. Increase protein. Incorporate foods like dairy, meat and eggs. A recent study indicated that some daily dairy such as a bit of milk, yogurt or cheese increases metabolism. Track your exercise. Maintain an exercise journal to help maintain focus and positive feelings about your efforts to lose weight. Move and have fun. Think like a child when exercising. Dancing with your kids can burn as many calories as the Stair Master. Brush your teeth. Brushing provides a cue to stop eating, so brush after every meal or pop a few breath mints.